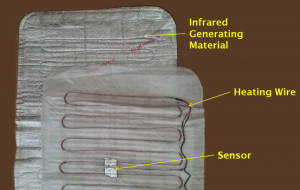 People have often asked how the Bio-Mat creates infrared. It does not use LEDs. It uses a material that generates infrared very efficiently, which is based on NASA technology. In 1967, NASA developed an alumina-silica material that when heated generated a large amount of infrared. In 1982, NASA released the patent on this technology. In 1990, using the NASA technology, Japanese researchers made a material of alumina, silica and carbon fiber to generate infrared. Seven years later, in 1997, Richway International, the manufacturer of the Bio-Mat, used the Japanese material in the creation of the Bio-Mat. The material that generates the infrared is a thin metallic sheet. A heating wire is used to heat this material. High quality sensors are used which feed back to the controller. When the material reaches the set temperature, the power is cut to the heating wire, while the infrared generating material continues to produce infrared. This is very efficient. When power is not needed for heating, the power is diverted to generating negative ions electrically through a different system.